On the weekend of April 27th/28th the Port Adriano Race (4* Eurosupa Long Distance) took place on the beautiful Balearic Island Majorca. The weather forecast was terrible, 15°C and rain, but that was made up for by perfect organization (incl. airport transfers) and the great hospitality of the Mar Balear crew. 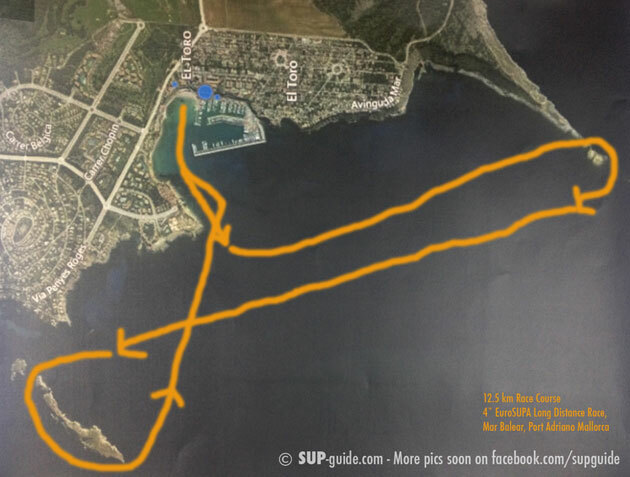 The event started on Saturday with the Long Distance race , it was a 12.5km Open Ocean Race, start was inside Port Adriano, then a paddle out into the ocean for about 1-2km then paddling parallel to the shore and circling 2 big islands for a finish back into the harbor. The course was very technical with waves from the side, heavy rain messing up the ocean and strange cross-chop and waves bouncing back from the islands. Austrian SUP Veteran Peter Bartl, who recently signed with JP Australia, was leading from start until 1 or 2km, then he slowed a bit down when the ocean got rough and Roman Frejo (Starborad, Spain) passed him. The leading pack consisted of Peter, Roman, Paolo Manconi (Jimmy Lewis, Italy) and Chris Parker (14’). Fabrizio Gasbarro (Fanatic, Italy) was chasing the group but had nobody to draft off. Roman fell and Paolo passed him, but Roman caught up again. After the 2nd island Paolo lost the group, Fabrizio almost catching up with him. In the end, Roman Frejo finished first (1:20:54), Peter Bartl 2nd (1:21:15), Paolo Manconi 3rd (1:22:20), Fabrizio Gasbarro 4th (1:22:53) and Sramek Branislav 5th (1:23:41). For the women’s, it was a very clear win for Sonni Hönscheid (SIC) who is from Germany, but lives on Hawaii and the Canaries. She finished in 1:25:35, almost 7 minutes ahead of local Laura Quetglas (2nd, 1:32:27, Peppersurf) and Barbara de la Maza (Fanatic, Spain). On Sunday the Sprint races took place, 3 Sprints: 600m, 400m, 200m. The overall rankings would be determined by a combined score of all races (long distance and sprint counting 50% each, with the spint score being determined as an average of all 3 sprints). While the 3 top women relatively consistently finished the sprint races according to their Long Distance rankings, there was a lot of variation in the men’s sprint races. Peter Bartl won 2 races, Paolo Manconi one and Roman Frejo could not keep up with his great long distance performance in the sprint. 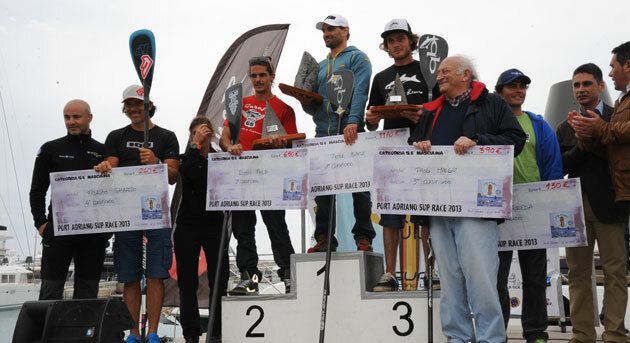 So in the end, the overall victory went to Peter, Roman was 2nd and Paolo 3rd. Here is what Paolo Manconi (Jimmy Lewis, Italy, 3rd overall) said after the race: “These were 2 good days of racing here in Mallorca. On the first day we had a pretty cool long distance race with a very technical course full of currents and backwash from the islands. I managed to stay with the first group from the beginning and then ultimately finished third at the end of the race. Big Thanks to the Mar Balear Crew, especially Manuel Simoncelli and Laura Quetglas for a perfectly organized event in a great location!